You may already know that during Easter and the time running up to Easter I get slightly addicted to Creme Eggs, my goodness I love them, so the other day I decided to not only bake some Creme Egg Cookies (HERE) but I also baked some Creme Egg Cupcakes too that I'll be sharing with you all today and wow they are delicious! 1. Firstly freeze 12 of your mini creme eggs for a few hours or overnight, this is a must if you want your mini creme eggs to stay in tact whilst the cupcakes bake in the oven. 2. Then pre heat your oven too 180c or gas mark 4 and line a muffin tin with paper cases of your choice, I actually got some cute yellow ones with polka dots from Poundland! 3. In a large mixing bowl, cream together your butter and caster sugar until it's pale and creamy, then pop in your eggs and vanilla extract and mix again. 4. Once all of your wet ingredients are well combined start adding the flour and cocoa powder gradually. 5. 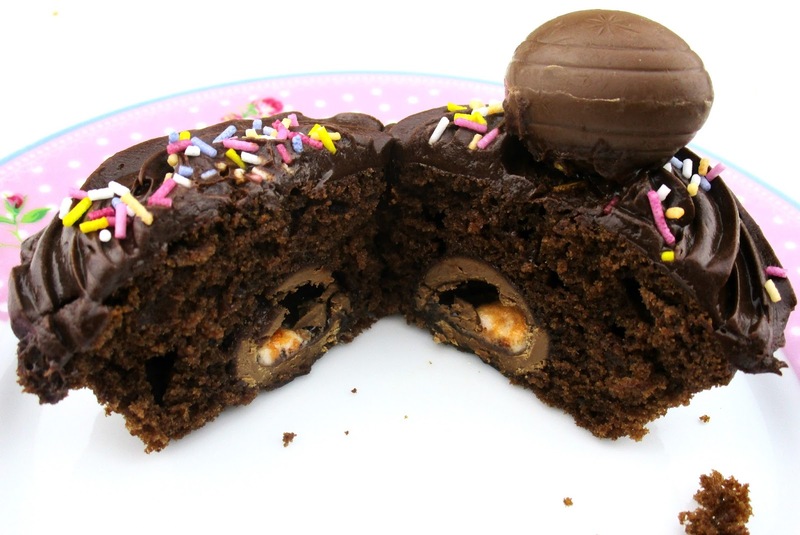 Pop a spoonful of the cupcake batter into the bottom of each cupcake case then place one of your frozen mini Creme Eggs on it side, on top of the batter. 6. Once all your mini Creme Eggs are in place, top them off with another half a spoon of cupcake batter making sure you cover the creme egg well. 7. Pop into the oven and bake for around 20 minutes or until they are springy to the touch. 8. Once the cupcakes are completely cool it's time for the fun part, frosting and decorating. In a large bowl, beat the butter and cocoa powder together until combined, then add the milk and the vanilla and beat again until smooth. Gradually add in the icing sugar until you get your desired consistency, if you find your frosting is too runny then just add more icing sugar or if it's too thick add very small amounts of milk until your happy. 9. Once I frosted all my cupcakes (I used a star shaped nozzle and disposable piping bag for this) I finished the cupcakes off with more mini Creme Eggs on top and some sprinkles. And there you have it, easy but very yummy Creme Egg Cupcakes! I loved making these, they where so fun to do and tasted amazing. I love the fact that you get that hidden mini creme egg inside too, nom nom nom! 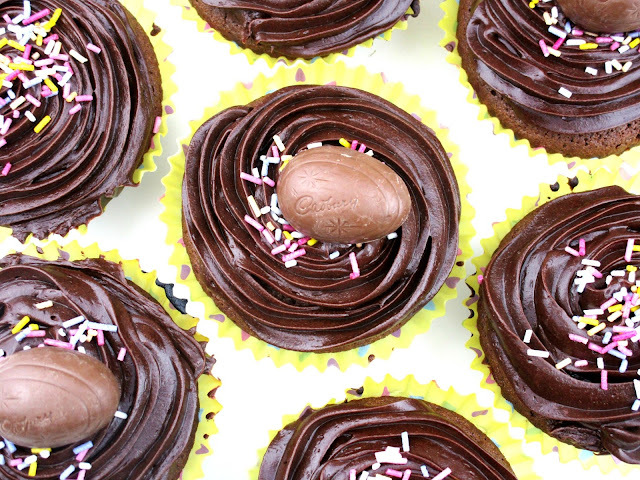 Do let me know what you'll be baking over Easter beaut's and if you give these yummy cupcakes a whirl, I'd love to know! 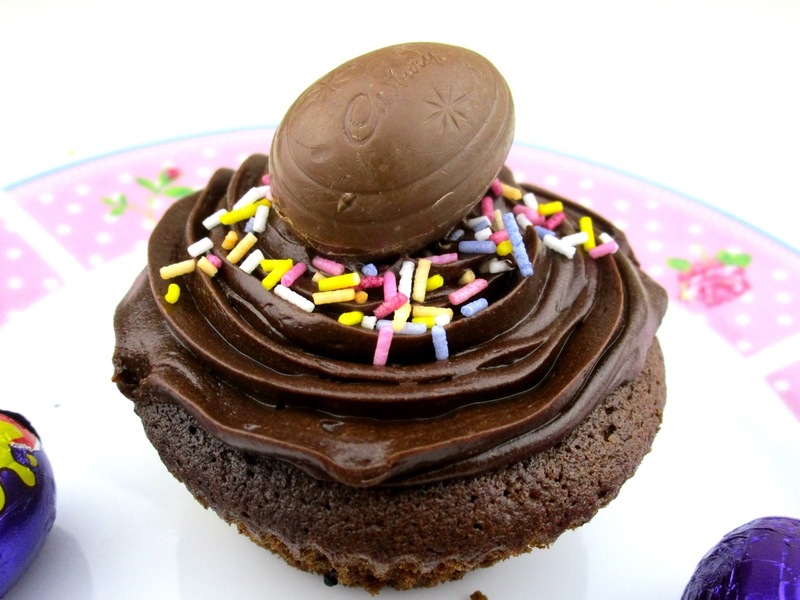 These look delicious - Creme Eggs in a cupcake is perfect!